Answers to your most common plumbing, re-pipe, and re-piping questions, and helpful links. Henrik Plumbing Inc. pulls plumbing permits, most of the work that Henrik Plumbing Inc. does require permits. required to have us start the work right away, our pricing is upfront and free. Based on your initial request will take into consideration your building type, construction, your wants and needs. We will then make proper re-piping plumbing recommendations. During the plumbing site survey we will ask you many questions about your house and plumbing. Which plumbing systems do you want to replace? Water? Gas? Drains? Other? Why? Why exactly do you want to Repipe? What exactly are the plumbing problem(s) that you are having? How old is your house? How many square feet is your house? How many toilets are in the house? How old is your water heater? Have you replaced your water main? Have you had any previous plumbing problems? Have you made any plumbing repairs. Are any of the drains slow or leaking? Are you aware of any mold growth? Do you have any other planned construction projects or additions? site survey process. If you have a list of questions, We will be happy to assist You with answers. soft copper under ground under slabs. house you can expect to have leaking pipes in as little as 7-10 years, some times less. in the last 30 years with soft copper under the slab or type M thin wall copper. of water usage, gas bills that reflect more gas usage to heat water in the water heater. better way to go, repipe now. a private well or from a public water supplier. That supply water is usually treated and/or filtered before it enters into a home. drain water. PEX "A" is perfect for pressurized drinking water. The sewer or building sewer pipe materials are ABS, cast iron, PVC and clay. Workability, and Price A.B.S. black plastic is replacing Clay Sewer pipes. Area drains and storm drains are the piping that drains the water away from areas around pools, decks, walk ways, driveways, patios, and areas that are prone to receive water during a storm. These drains are vital to protect the property, the foundation, and basement, from flooding or water damage during a storm. This drainage system does not normally drain into the building drain or sewer system. This systems drains to the curb or into a wash. The gas supply systems is the gas piping system that supplies natural fuel gas to fixtures and appliances such as stoves, water heaters, dryers, heaters, BBQ's, fire pits, pool heaters, and central heating. faster, cost less and last longer. Natural gas in residential plumbing is low pressure approximatly 4 PSI. projects that require gas appliances. Tank water heaters have improved a lot in the last ten years. Tank water heaters can boast energy efficient ratings as high as 96-97%, and can also make the claim to "endless hot water" at a rate of three gallons per minute. Tank water heaters have improved in safety in preventing flash backs from gasoline fumes in garage areas. It is still recommended that water heaters be installed on a stand where the pilot light is at least 18" inches above the ground. Any type of water heater that burns fuel must have proper air supply. It is recommended that all water heaters be placed outside of that house either in a garage or in a shed. Tank-less water heaters do not require a shed. In extremely frigid conditions extra precautions may be required to protect your water heater. Tank water heaters also work best with re-circulation systems. Tank water heaters also work best with solar systems and can also store the heated water from a solar panel. Tank water heaters are generally considered more comfortable because you have precise control of your warm to hot water. Tank water heaters also have an initial lower cost at the basic level and require no electrical supply. Advanced Tank Technology is Top of the line and qualifies as "green." Some of the new tank water heaters are pilot-less and have a hot surface electric ignition system, these pilot-less water heaters do require an electrical outlet. Tank-less water heaters are getting a lot of advertising and public exposure lately. Tank-less water heaters are not new and have been around since the early 1900’s. A tank-less water heater is as basic as a coil of copper of water pipe with a flame under it. New technology has improved the copper coil to a new science of sensors and switches that regulate the temperature to flow rates. Tank-less water heaters have no tank, the burner heats the water as the water runs through the unit. Tank-less water heaters are also referred to as flash water heaters, because they use a lot of fuel and produce a lot of BTU in a short period of time. A basic tank water heater can produce on average 38,000 BTU, in contrast a tank-less water heater can produce up to 280,000 BTU’s. Tank-less water heaters fall into the "on demand" type of water heater. Because tank-less water heaters can heat water up in a flash they will not reheat water in a tank again and again wasting energy. Tank-less water heaters can also produce "endless hot water" up to 13 gallons a minute "forever hot water" and never run out. You could run up to 5-7 showers constantly and never run out of hot water. If you have a Roman bath tub or a large family that loves to take long showers, "going tankless" may be the right choice. There are a few things to consider about going tank-less. 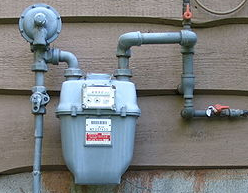 Tank-less water heaters require a dedicated gas line 3/4" inch for the first 30' feet from the meter to the water heater and a 1"inch line up to 80' feet. Tank-less water heaters also require an electrical outlet to power the vent fan and the computer board. The average energy efficiency rating is only 70-82%. There are new highly efficient tank-less water heaters that are up to 95-97% efficient. Tank-less water heaters do not have to reheat water in a tank. Tank-less water heaters should have an inline water filter feeding to the tank-less water heater. The venting on a tank-less water heater is expensive and must be properly installed. Old existing class "A" or "B" venting is not proper with tank-less and venting cannot be shared with other fixtures. Tank-less water heaters also require maintenance at least once every three years, where the heating unit needs to be acid washed. Be careful not to cut corners by under sizing gas lines, using existing or improper venting, sharing gas lines or not installing a water filter. If you do not properly install a tank-less water heater it can be dangerous, and also void the warranty. Make sure you have proper fresh air ventilation and proper exhaust venting. A tank-less water heater is an appliance that requires natural gas and electricity. If the power goes out, you have no hot water. Tank-less water heaters are expensive if properly installed. Tank-less water heaters also qualify as being "green." Tank-less require a lot of "green" to properly install, know the facts and make your choice wisely. Make a list of reasons for going tank or tank-less, compare your reasons and prices, then decide. Repiping is usually in reference to replacing the water supply piping. Drain re-piping is recommended at the time of water supply re-piping. drain pipes remind you later. An onsite inspection is critical for a professional and accurate re-piping Estimate . Standard re-piping projects include installation of all new hot and cold water piping from the water source to all existing faucets and fixtures. Unless specifically included in the proposal, drain replacemeand fixtures are not included. all affected areas—otherwise, your wood could warp and swell, electrical parts could short and cause fires, metals could rust, and remaining moisture could lead to deadly mold infestations. Jarvis has worked with all major insurance companies in our area to quickly return water-damaged homes to pre-loss condition.Our professionals understand the importance of quickly and efficiently drying and repairing all water causing damages. We are experts with years of experience in quickly evaluating the source and damage caused by water. and we have summarized each step - The re-piping process is also known as a repipe job (re-pipe, re-piping, repiping, new piping, re-plumbing, re plumbing. maintenance and installation, and learn what to look for in choosing a company to install your home comfort system. When planning your home renovation, you may be working with a wide range of people. Architect - The architect designs the plans and creates a list of material specifications. He or she can also provide references for contractors who can implement your home renovation. designing your renovation, while others do only the actual renovation work. Interior designer - The interior designer can help plan your rooms to make them more functional and can solve space problems, as well as give your home a whole new look. with the planning and designing phase. San Pasqual, Topanga, Two Harbors, Universal City, Valyermo. Lockwood Valley, Meiners Oaks, Mira Monte, Mission Oaks, Newbury Park, Oak Park, Oak View, Piru, Point Mugu, Saticoy, Somis. Dana Point, Newport Coast, Newport Beach.